In case you didn’t know Panna Cotta originates from Northern Italy and literally means ‘cooked cream’. In earlier times the dish was set with boiled down fish bones in order to extract collagen, but luckily, today we can use gelatin to set it! There are endless varieties to this dessert and a quick Google search of images will show you just that, the most popular are those topped with fruit (mainly berries). Coarsely crushed pistachios to top. In a saucepan heat the coconut milk/almond milk on medium heat and add in the raw honey. Stir until the honey is dissolved and the allow the mixture to warm up for a few minutes but be careful it doesn’t boil. In the mean time take a medium sized mixing bowl (or one that will hold the contents of the mixture in the saucepan) and add in gelatin, pour over the cold water and let sit for 5 minutes. While the gelatin is resting, check the mixture in the saucepan by dipping the tip of your finger in, it should feel warm not hot. Remove the saucepan from the heat then mix in the beetroot juice to give the mixture it’s pink colour and the Rose Water to give that classic Turkish Delight flavour. Pour the mixture over the gelatin in the bowl and using a whisk mix well so that the gelatin is mixed through. Add the mixture into a glass measuring cup with a spout for easier transfer to your chosen containers. our into even sized ramekins or glasses and place in the fridge to set. Check to see if the Panna Cotta is set by slightly shaking the ramekin or glass, your Panna Cotta should be holding its shape but still have a little jiggle to it. 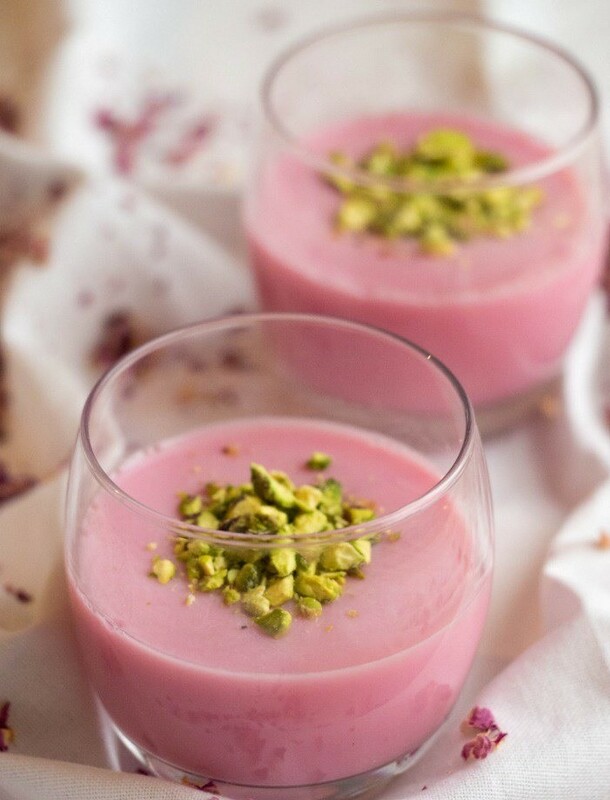 To serve, add some coarsley chopped pistachio on top of each Panna Cotta.